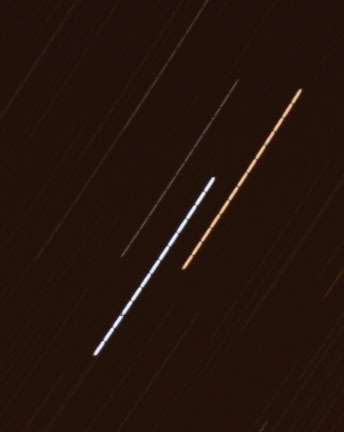 Photographing star trails is a good project to get you started in astrophotography. It’s quite easy to do, and the results can look really good, but there are a few tips and tricks that you need to know. These instructions refer to digital cameras, but they also apply to film cameras. You need the right camera for star trails, and most types of astrophotography as well. The most important thing is that you should be able to give a exposure time of several seconds, and ideally longer. Many compact cameras restrict you to exposure times of no more than few seconds, though some will go up to 60 seconds – a point to consider when buying one. But DSLR (digital single lens reflex) cameras, which have interchangeable lenses, usually give you full control over the exposure time, with timed exposures usually up to 30 seconds and also a B setting, which keeps the shutter open for as long as you hold the shutter button down. The camera should also give you full control over the focusing, the lens aperture and the sensitivity setting (the ISO number). You’ll probably need the instructions handy to do this! Holding the shutter button down for a long period is tiring, and also runs the risk of jogging the camera. So you’ll probably need a cable release and a tripod as well. The cable release allows you to fire the shutter without touching the camera. Many compact cameras don’t have facilities for these. Some cameras use conventional cable releases costing just a few pounds, but the popular Canon DSLRs require a special accessory costing rather more – though there is an alternative. Basically, you need to give a time exposure with the camera fixed pointing at the sky. Fix the camera to the tripod, choose your part of the sky and open the shutter for your chosen length of time. Bear in mind that the sky is usually darkest overhead, so you can give longer exposures if you are pointing high in the sky. But the most interesting pictures are those with some foreground landscape, so it’s often a matter of giving shorter exposures for the prettiest results. The way you hold the shutter open for time exposures depends on your camera. See this page for help on doing it. Don’t have a tripod? Then you’ll just have to prop the camera up using whatever you can. It works, but it’s more tricky. In theory, the longer the time exposure, the longer the trails. But in practice it isn’t as easy as all that. There are a few tricks to getting the best results. 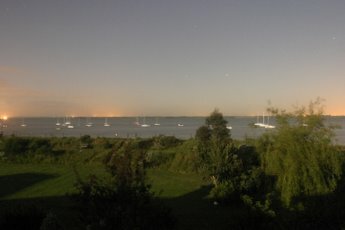 One big problem is light pollution, which limits the longest exposure you can give except in the very darkest of sites. The worse your sky, the shorter the exposure you can give. The exposure is a combination of the ISO setting and the lens aperture. The aperture is given as a focal ratio, with the smallest number being the widest aperture. The apertures run in a series which will be something like 2, 2.8, 4, 5.6, 8, 11, 16 and 22. These are focal ratios and photographers refer to them as, for example, F4 or F8. 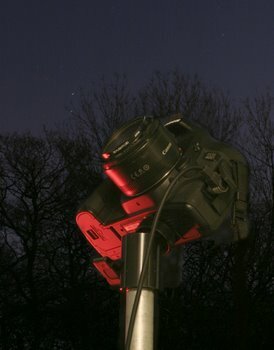 Use the widest aperture, which will record the most stars, and experiment with choosing the ISO setting on the camera. The higher the ISO, the more sensitive it is, so you might think that you’d get the best results using a high ISO setting. 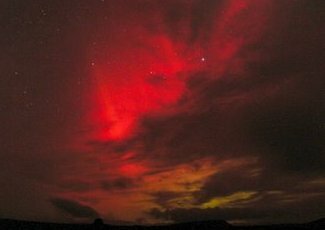 But this also records more light pollution, and under typical UK conditions, even in many country areas, the lower settings may be best as you can keep the shutter open for longest. And the higher the ISO the more ‘noisy’ the results. Here, ‘noise’ means the lack of smoothness of the picture. 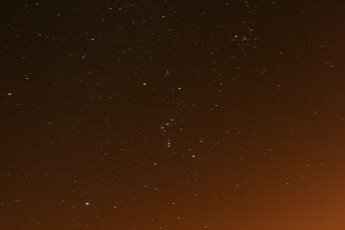 Even at the lowest ISO setting, you might not be able to expose for more than a few seconds before the light pollution becomes really horrible. If you live in a town, start by trying exposures of 5, 10, 20 and 30 seconds to see what you can get away with. In the country you may be able to give much longer than 30 seconds. If you close down the aperture a bit and try longer exposures you’ll get fewer stars but longer trails before the light pollution becomes bad. 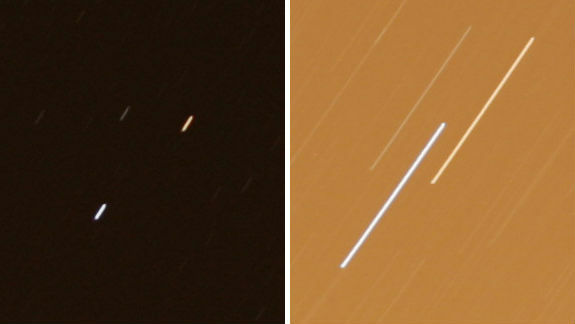 The aim is to find an exposure time which gives you nice trails without too bright a background. But you don’t get more stars by increasing the exposure time once they have started to trail – as soon as a star has recorded on one pixel its image moves on to other pixels so the light doesn’t build up on any one spot. All that happens is that the background gets brighter, as you can see in the two photos below. 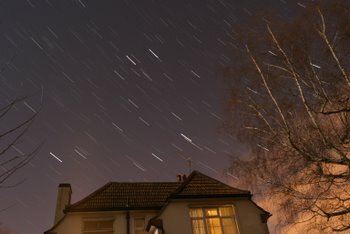 Exposures of 30 seconds or shorter don’t give very long star trails. But all is not lost! With digital photography and access to an editing program such as Photoshop, you can add short exposures to get the effect of a longer one. If you don’t have Photoshop there are free editing programs, but you must have one that allows you to work with layers – that is, putting one image on top of another and varying its properties so that you can combine the two. There is also a program called Image Stacker(http://www.tawbaware.com/imgstack.htm)which costs US$17 – about £11 – which will do the job for you automatically. In Photoshop, the technique is to open the separate images, and for each one select all (Control A), copy it and then paste it on top of your start image. The layers box will show each one being added but you will only see the topmost image as you do this. Then, starting with the topmost, alter the layer properties from Normal to Lighten. As you work down the list, the star trails will lengthen but the background brightness will remain the same. 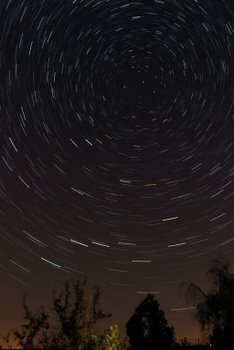 Eventually you will have a stack of images with star trails as long as the full exposure time but the background only as bright as the single exposure time. You can have some fun experimenting with the other layer options as well. The Screen option will brighten the image, which is good under other circumstances. Finally, flatten the layers and save with a new filename. Using this method there will be short gaps between each exposure, but these are usually only noticeable when the image is viewed at 100% and the stars are near the celestial equator. Close to the Pole, the individual trails are more likely to overlap.